The Coupled Ion Neutral Dynamics Investigation (CINDI) is a small NASA mission of opportunity studying space weather in Earth's atmosphere. 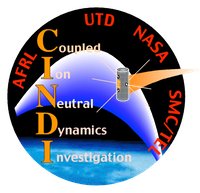 CINDI consists of two instruments built at the University of Texas at Dallas and is aboard the US Air Force's Communication/Navigation Outage System satellite in low Earth orbit. We launched in April of 2008 and are currently in our extended mission. We have resources for educators, students in grades 6 and up, and interested members of the general public, as well as news and information on our educational events. The CINDI Education and Public Outreach program is part of a larger family of activities from NASA's Heliophysics team. Together our science seeks to explain Big Questions involving Sun-Earth connections. We also have partnerships with several groups that help extend our educational reach and impact. Consider visiting the pages of our numerous partners as well as us. UTeach Dallas: Devoted to recruiting, developing, and retaining a new generation of secondary mathematics and science teachers at UT Dallas. Women in Physics Camps: The University of Texas at Dallas Women in Science Alliance (WiSA) conducts camps for middle and early high school girls each summer. We at CINDI are a proud charter sponsor of the camps, which have run annually since 2004. The Department of Science/Mathematics Education at the University of Texas at Dallas Masters of Arts in Teaching Program in Science Education integrates has partnered with the CINDI Education program to provide resources to teachers in its long term professional development programs. The UT Dallas Regional Collaborative for Excellence in Science Teaching is one of 66 regional collaboratives throughout the state of Texas, and is proud to partner with CINDI in support of its teachers and their students.